I am happy to have my dad as guest poster on my blog. 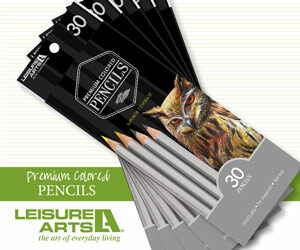 When I went to Creativation, I got a set of the leisure arts premium colored pencils. I have several sets of pencils but my dad has way more – since he does lots of drawings with colored pencils – so I figured he would know best if they were good…. So he used them in his most recent drawing. quality for my latest drawing. I hope you enjoy the attached picture. And here’s his awesome picture! Isn’t it great? I hope you enjoyed his art & his review! Thanks Dad! Although I received the colored pencils for free, all opinions in this review were my dads and he was in no way influenced by the company. You can get the pencils by clicking this affiliate link below – this means if you click on the link and purchase the item, I will receive an affiliate commission.